Anonymous, 04 Jun 2016Hi Deep , Thanks for your comments . Can you tell me how is the battery life of this phone in ... moreDefinitely it comes one day when the Internet is also on..
it was perfect except battery.. Deep, 02 Jun 2016Pretty Good! Bought this phone a week ago. The display is pretty good. Curved display looks... moreIs it a good phone for college going students? I mean that what about battery backup does it work whole day with internet on? Deep, 02 Jun 2016Pretty Good! Bought this phone a week ago. The display is pretty good. Curved display looks... moreHi Deep , Thanks for your comments . Can you tell me how is the battery life of this phone in terms of screen on time . Does it last a full working day ? Bought this phone a week ago. The display is pretty good. Curved display looks stunning. Camera is of an eight MP configuration. The quality of the camera is amazing. Good low light pictures. Crystal clear vedio recording - 1080p HD. Now coming to the speakers, compared to other phones, the volume is a bit low and could have been better. Headphones are pretty good and music quality is pretty good, considering that Panasonic is a pretty good brand when it comes to music hardware. Performance- No lag. Smooth response. IR Setup - Using my phone as a DVD and TV remote as well. Fingerprint sensor works well and is fast to recognise the prints. Coming to the battery, on moderate usage, it lasts one day - Around 13 hours at a stretch with an hour of music and 6 hours of internet. Overall a good phone. I would give it a 8 out of 10 in overall features and performance. 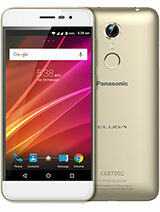 Total of 16 user reviews and opinions for Panasonic Eluga Arc.